It’s true — you will never have a bigger fan than your dog. Loyal companion, faithful and true to the end, the dog has ascended to a revered place in American culture. Over 36 percent of all American households include at least one dog. Clearly, the lovable canine has collected some fans of his own. No Greater Friend will warm your heart and grace your coffee table. 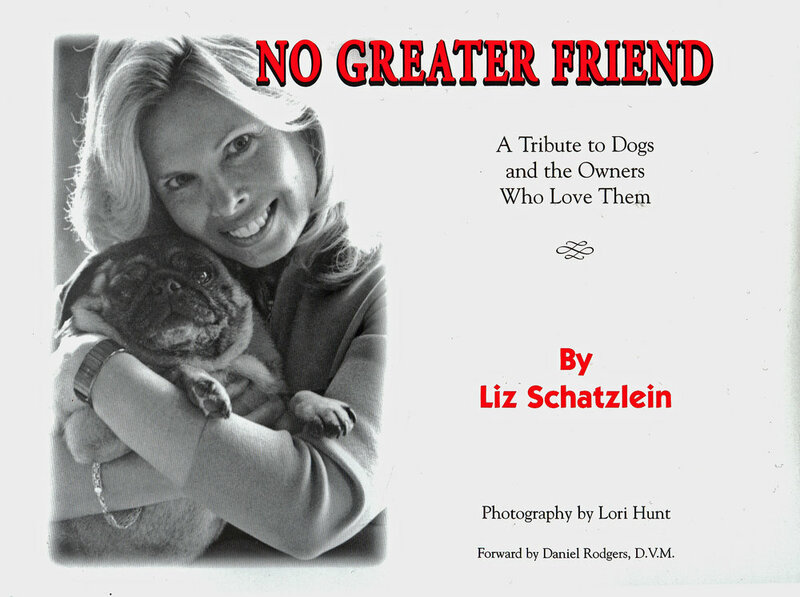 In No Greater Friend: A Tribute to Dogs and the Owners Who Love Them, Liz Schatzlein examines the very special bond that exists between humans and their canine companions. Through a series of vignettes, Liz shares the stories of some remarkable dogs and even more remarkable dog owners. From Harley, the blind hunting dog, to Midnight, the sign-language-reading poodle, and dozens of dogs in between, the reader will be captivated and moved by the depths of affection exhibited by dog and master. Featuring the photography of Lori Hunt, No Greater Friend is sometimes funny, often poignant, and demonstrates why the canine has truly become “man’s best friend”. Hardcover with Dustjacket (ISBN 0-9727301-0-9). 64 pp.